Filling or liquid delivery line at storage tank can be protected with an end of line liquid product detonation flame arrester. This flame arrester works like a siphon. 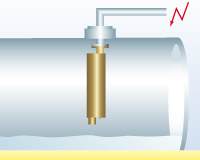 The liquid product is used to form a liquid flame arrester medium to prevent flame transmission of a detonation. End of line liquid product detonation flame arresters prevents light-back at the deflagration and stable detonation of potentially explosive vapor-air, and or gas-air mixtures.